What is a Yard Curb? 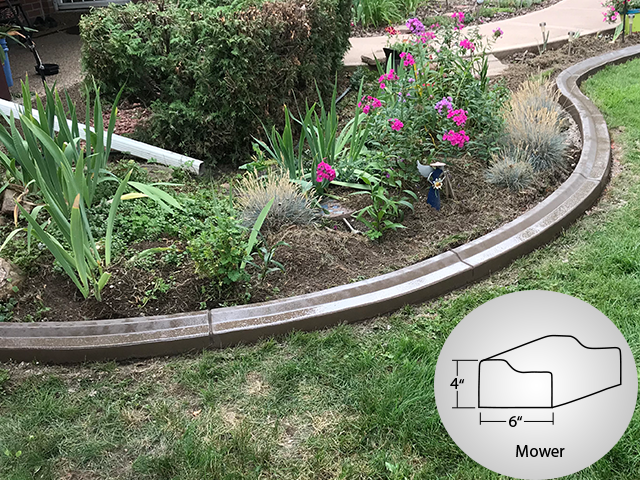 A Yard Curb is a continuous custom concrete border extruded from a landscape curb machine creating an extremely durable and permanent border between the flower beds and lawn. Yard Curb LLC has had a great deal of experience and is highly regarded for its expertise in the areas of decorative landscape concrete borders. Yard Curb is offering landscape curbing for a wide range of projects, including gardens, tree rings, putting greens, office buildings, industrial buildings and major urban development projects. The various projects you may consider include new construction, renovation and the revitalization of old garden beds and borders as a way of providing curb appeal for your property. Yard Curb provides a free on-site estimate, with master planning, design and construction documentation for the project. Finally what starts as an idea, quickly turns into a finished product that's tailored for each client, and incorporated in cost effective ways to benefit the long term value. Most landscape curbing projects can be finished in one day. Yard Curb provides decorative concrete landscape borders which has many applications including landscape edging, tree ring borders, downspout drainage and many more. Ground preparation is very important in achieving a professional looking product. A trench, one inch deep and nine inches wide, around the landscaping beds is all that is necessary to accomodate the machine. Ground preparation can be completed using shoveld, a sod cutter and trenching unit. Concrete is prepared in a morter mixer. Sand, cement, fiber and water are the basic ingredients. The consistency of the concrete is very important. The mix must be very dry. Color can be added to the concrete mixture to increase the versatility and beauty of the final product. After the mix is ready, the concrete mixture is shoveled into the machine and extruded into a professional, continuous landscape border. Using specially formed hand trowels, the concrete border is quickly smoothed into beautiful professional edging. 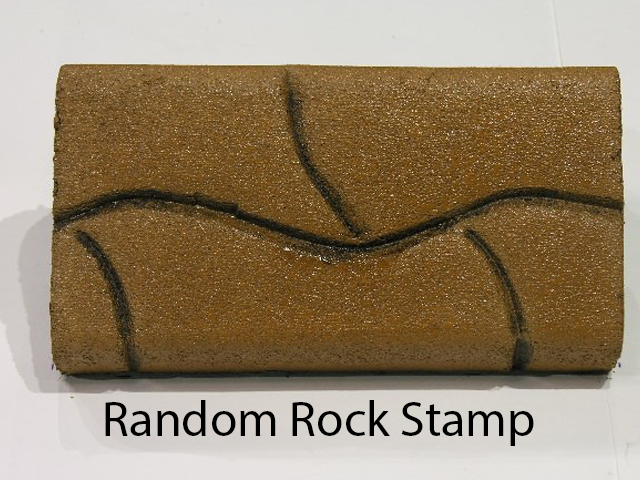 While the concrete is still wet, impressions are made by using various stamping tools. In addition, other coloring techniques can be done at this time. As a precaution to cracking from subtle ground movement, control joints are cut about half way through the edging every three to four feet while the concrete is still wet. In the colder climates, the control joints are cut every two to three feet. Is the Yard Curb permanent? The curbing we install is made of concrete. It is heavy, durable, and one continuous piece. This offers many benefits. However, if you need to remove the curb, simply have it cut or busted into smaller sections that can be disposed. We dig about 2 ½ inches deep by 10 inches wide. This can be done without disturbing your existing landscape beds. There is no footer as the curb is concrete and is its own footing. The benefit of our concrete curbing is that is a continuous piece of concrete. Individual blocks or bricks will shift over time and in the winter. 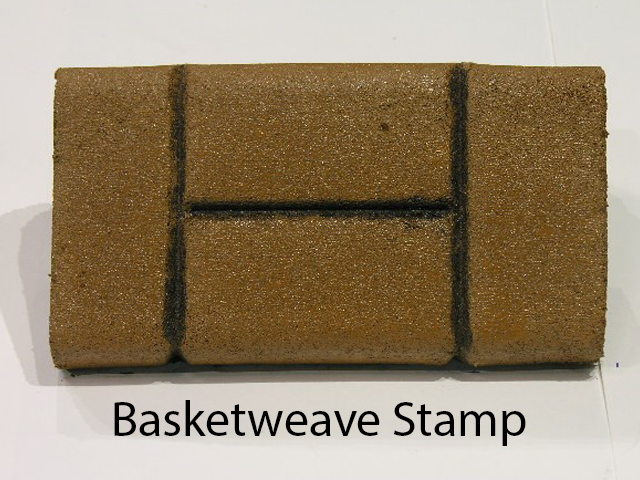 Our curb is fibermesh reinforced which is designed to take the place of rebar or steel and adds strength to the curb. We place control/expansion joints every 3 feet and are cut about 40% into the curb. This is designed to control the cracking of the curb during shifting periods and colder months. If the curb should crack, it should crack in the expansion joint and not be noticeable. All of the colors are iron oxide pigments that are mixed into the concrete during the mixing process. The color will not flake off or disappear over time. You may experience a little fading, but this is normal in any outdoor color application. A sealer can aid in the lifetime of the color, we recommend sealing every year. We make sure the base under the curb is compacted and level. Sometimes we will put a small layer of sand under the curb to ensure it is level. If the curb should settle a little, the expansion joints should control the cracking. We experience very little cracking however concrete will crack. We take every precaution to limit the cracking and try to control it with expansion joints. If a crack occurs outside of the joint, we will be happy to repair your curbing. Are you limited to a design layout, such as Timbers? Concrete curbing is ideal for most any terrain. A small concrete extruding machine is very easily maneuvered, thereby providing the design flexibility needed for your specific lawn type. It curves, circles, or extrudes straight lines to allow you any design your heart desires. We encourage the homeowner to see the awe of the process. It is definitely a site to see, from before to after transformation within a few hours is amazing! How effective is this Concrete Curb in keeping out grass? Extruded concrete curbing has a proven track record at preventing sod from entering your landscape beds. Your constant (losing) fight to keep sod out of your flower beds ended with this invention. You also do not have weeds growing in between this edging since it is all one continuous piece, nor can the sod grow under it if it is prepared correctly. There are a few different molds (shapes) to choose from. The most common is “slant” & “mower” style. With our machine, both molds have a minimum 4” heights in back and 2” on front. The curb is actually 6” wide. Our molds are designed high enough to keep sod from growing through it, and also high enough on the back to retain your bed covering, such as mulch. As long as your area is prepared properly and your grass clippings do not go into your flower bed, you will not have creeping sod in your flower bed area any longer! Does this process damage my lawn or flowerbeds, and what can I do to prepare for the installation? There will not be any damage to your landscape! In fact, we recommend your sod, flowerbeds, and sprinkler systems be installed prior to our arrival. 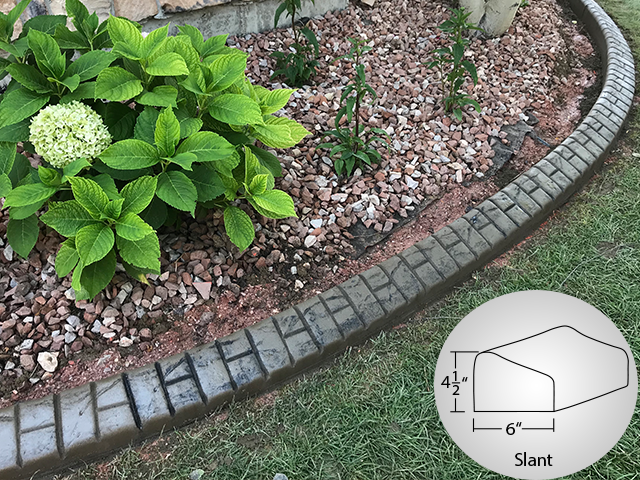 Once you approve the design of your flower bed, we sod cut the design with a 10” sod cutter so you will have that beautiful smooth flowing curb. Not only does that remove the sod for placement of the curb, but also gives you the opportunity to see the flow of the bed area prior to the installation of the curb. In other words, it still isn’t too late to change your mind on the flow. The concrete curb is very vulnerable during the first twenty-four to forty-eight hours of installation. It is imperative to keep guests, children, and pets away from the curb for the first few days. In addition, many homeowners have irrigation systems which need to be turned off the day before our arrival and not turned back on until two days after installation. If the curb is damaged from any type of force we can fix the curb, however there will be an additional fee for this service. After the first few days, the curb is strong enough that animals and children cannot hurt the curb if they step on it. It is OK to rake your bed covering back into place a few days after installation, just make sure the curb does not take a direct hit from any tools. It is best to wait a few weeks before you begin any major replanting or changes to your bed area. Keep in mind, do not allow anyone to dig underneath the curb, or run over the curb with a vehicle. Your curb is only as good as it foundation, and it is not designed to be run over by a vehicle. Can anyone truly afford this? Compared to the “do it yourself” blocks that you can purchase and install yourself, our prices are very comparable AND it is installed professionally. There are a few things that our team will need in order to complete the job, including access to a water source (hose hook-up). At the time of the installation, all underground utilities should be clearly marked such as sprinklers systems, dog fences, and telephone/television/cable wires. Do I need to be present when the curb is installed? No. You do not have to be present during the installation. What kind of options do I have when it comes to decorative curbs? Curbing can come in several styles and shapes. The most common are called the "mower" edge or "slant" edge. 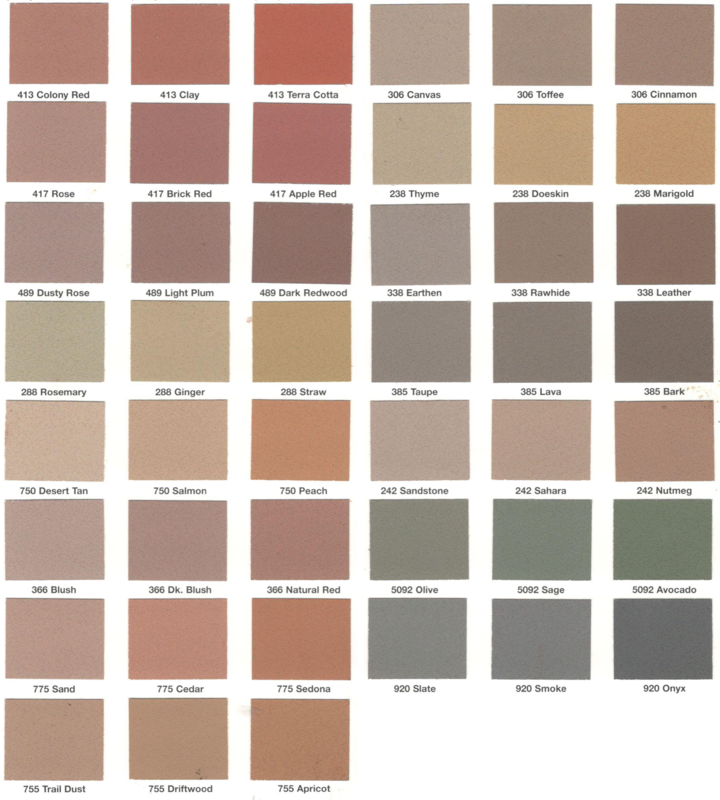 It can be colored usually to match or contrast your house colors or landscape. Browns, golds, and tans are popular colors. 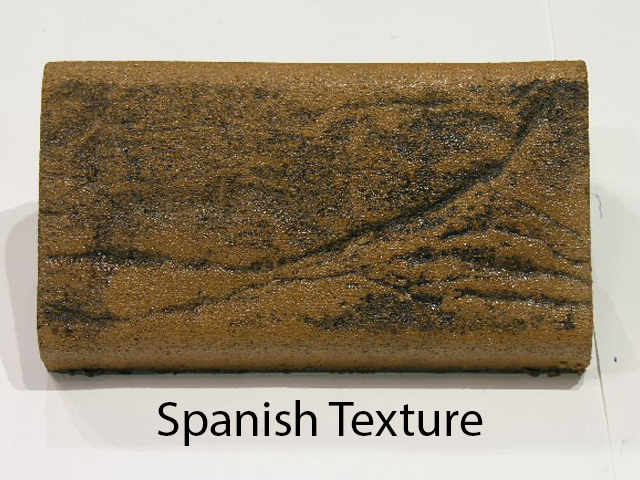 We use "integral" colors which are mixed directly into the concrete. Curbing can also be stamed and textured to add a custom look. This process uses an integral color and a darker color called an "antique release". The curb is then cleaned and sealed with a high gloss concrete sealer which not only brings out the color but gives your curb the "wet" look. 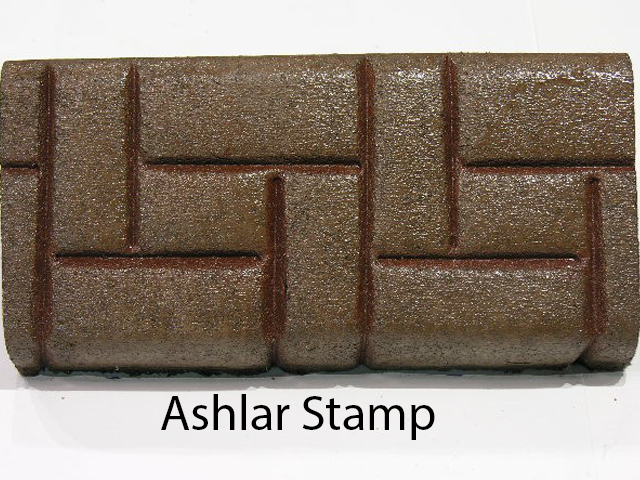 Yard Curb offers several different stamps that can meet your vision. I have an existing yard, can I have a decorative curb still put in? Of course you can. We use sod cutters or bed edgers to create a path for your new curb. Old edging can be removed or covered with rock, depending on how deep it is. The curb is put on the outside of sprinklers. This is usually the only difference. Sprinklers will spray easily over a curb. Most of the time because rock and plants are in place already we cannot it the machine in areas that need to be curbed so we must go outside the sprinler heads. Are forms set to install the decorative concrete landscape curb? Depending on the shape, options and footage of the installation, it normally takes only one day. Do you use reinforcement in your curb? Yes, we use a fiber mesh as well as a steel rod for extra reinforcement. Verify this with the contractor. No, a sealer is applied to prevent fading. Resealing is good maintenance practice. After I schedule the curb to be installed, what should I do before the Curb Crew shows up? If your yard has existing grass all the sprinklers need to be marked with flags or paint. A sod cutter will not be very friendly to a sprinkler head. Please turn off you sprinklers since we have been showered many times in the past. If you have a new property the dirt work need to be as smooth as possible. We obviously do a certain amount of prep work but we are not landscapers. How will replacing my existing edging with a Yard Curb effect my landscaping? We will remove the existing edging, and cut a 8-12 inch wide strip of sod away from the outside edge of your existing landscaping. This will allow us to extrude the curbe against your current edge. If you have any sprinkler heads where the curb is to be extruded, these will need to be repositioned. If they are inside or outside the install area, your edging will not be affected by the curb installation process. Will I be able to mow up against my curb? Your curb will be as strong as 3,000 psi and will withstand your mowers weight to ride along the edge of the curbing. The blades of your mower will not damage your curbing, and will allow you to mow right up against it, resulting in less time spent weed eating around your landscaped areas. Are continuous concrete borders sold in stores? No. Concrete borders are extruded on site by trained experts. The process is labor intensive. When done right our work will leave little to no discernable evidence of our having been there. Where do I find the pieces used in your borders? Our product is the result of the concrete extrusion process. It is one continuous piece from start to finish. The control joints or expansion lines give the appearance of individual pieces, but are actually only cut part way through the border. Do tree roots harm or crack concrete borders? YES. As with all concrete, roots may affect the integrity sometime in the futures. If roots are near the ground surface, we will discuss the course of action to be taken during our consultation. Feeder roots may be cut in half, and the expansion joints cut all the way through the border allowing it to be reset as needed. In some cases we suggest not placing a broder. What are the advantages of concrete curbing? 1. Concrete curbing will not rust and there are no sharp metal edges on which kids or pets can cut themselves. 2. Curbing is a permanent edge that does not require replacement every few years. 3. It adds to the value of your home. 4. Concrete curbing provides a better barrier between your lawn and other elements of your landscaping. 5. Our curbing can be made to match your personal landscape theme or syle. 6. Concrete edging is more lawn mower friendly. 7. It can outline or accent your landscaping with a more dramatic affect than metal or plastic edging. How long will my yard curb last? At Yard Curb we use additives such as fiber mesh and reinforcing bar, and other chemicals to strengthen the curb. This gives it a long life span. Does winter-time installation have any adverse effect on the integrity of concrete borders? No! In fact, cool but mild temperatures are less stressful on conrete both during the installation and curing process. We do not install when temperatures are going to fall beneath 28 degrees within two days after installation. And generally do not install when daytime temps are below fifty degrees. We have installed many borders during the cooler months with no adverse results. Why should I spend extra money on stamping or color? Curbing is a great way to add value to your home. If you choose to have a color, stamping, or lighting it will add to the curb appeal of the home. This will increase the value of your home even more. Adding stamping and color lets you match the style of your house to bring your home and the landscaping together. What would the typical schedule be (including when the work could begin and steps in the job) after customer approval and contract signing? Do you desing the layout? The primary design is the customer's resposibility, our foreman can make some suggestions if needed. When planning your curb layout keep in mind where your sprinkler heads are. Try to design the layout so the curb will be behind the sprinkler heads by a minimum of 2 inches. A garden hose laid out on the ground can be a useful visual aid. Try to keep your desing simple. Our fees are based on standard installation, custom or intricate designs may institute additional charges. In most cases we do not trench. Not trenching allows the decorative border to have a higher profile, thus being less likely to be hidden by the slightest growth of grass. Our borders are gordeous and installed to be seen. In the event that our customer prefers trenching, such as in the case of our mower edge style curbing, we will gladly accomodate. How many colors do you have to choose from? We have plenty of colors to choose from. If I want to add more border in the future, how close will it match my existing border? If added within a year, there should be little to no visible difference in coloring. However, we always strive to match existing borders as closely as possible. In most cases, a new coat of sealer is all that is needed to have all the border appearing the same. How long does the installation process take and will there be any damage done to my yard? In most cases the complete process is completed in one or two days, depending on your total footage. We mix all products on site, so no heavy equipment that would cause damage is needed. Efflorescence occurs with all concrete and is the most frequent problem that concrete contractors face with colored concrete. Owners don't care about “plain” concrete, but colored concrete is another matter. They complain that their contractor didn't give them the color they ordered, and sometimes they withhold payment. Efflorescence is caused when soluble salts and other water dispersible materials come to the surface of concrete and mortars. It's induced by low temperatures, moist conditions, condensation, rain, dew, and water added to the surface of fresh concrete to assist troweling. It can occur very soon after exposure to moist or cool conditions or gradually, especially when it comes from within the concrete or from the subgrade. Slabs achieve their highest strength, have the most abrasive, wear-resistant surfaces, are the most impervious, and have the best resistance to shrinkage when they are wet-cured. But wet-curing increases the risk of efflorescence, too. The use of curing covers for floor construction is a way to wet-cure concrete and also keep calcium salts from reacting with carbon dioxide, making removal with water possible. The covers have a waterproof layer to prevent water from evaporating and a layer that wicks water and spreads it evenly across a slab to provide a continuous water layer. Workers first spray water on the slab and then place the cover to contact the concrete everywhere. The slab must stay wet during curing. 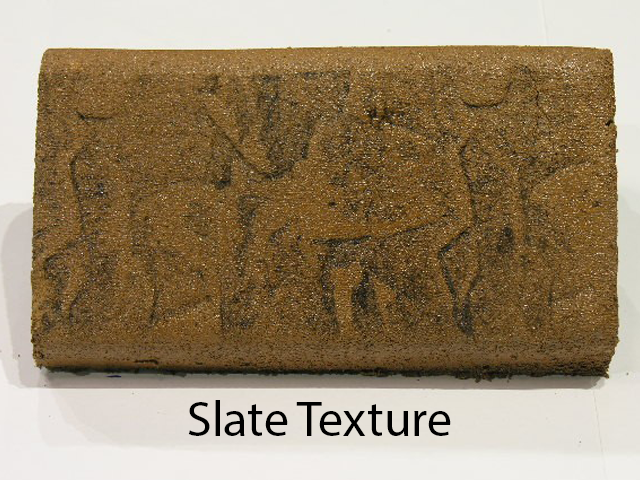 Afterwards, wet scrubbing, followed by completely removing the dissolved solvents before drying the slab, greatly decreases the possibility of efflorescence. When efflorescence proceeds to the calcium carbonate phase, it becomes insoluble and is much more difficult to remove—perhaps impossible. The application of a mild acid solution becomes the first course of action. These acids include vinegar (5% acetic acid), muriatic acid, or citric acid. Muriatic acid is purchased in full strength and must be diluted. So it's the most dangerous, requiring proper safety gear. When efflorescence can't be removed with acid washes, other commercial products are available. One is ethylenediamine tetraacetic acid (EDTA), which rapidly dissolves calcium salts. EDTA will also damage concrete, so it's best to test it on an inconspicuous sample area first. Does concrete curbing require maintenance? To keep it looking great you will want to wash it down occassionally and we recommed re-sealing other year. We offer this servie for $0.50 per foot. How will landscape curbing effect my existing landscape? Our curbing will be the crown jewell of your landscape design. Like fine jewelry brings to life a beautiful evening gown, our borders will enhance and beautify your landscape design. We will take great care when working around your valuable plant, yard art, and home. Will there be any left over concrete? There will be a small amount of scraps from trowelling the border, we place this on the back side of the border. Then cover it will your bed covering. Keep in mind, it is a very small amount. Can I afford Concrete edging? You will probably be pleasantly surprised how inexpensive our product is compared to other alternatives. There certainly are less expensive products available, but none that compares in the quality & beauty of concrete edging. When you consider the quality & long life of concrete edging it is certainly an outstanding value and the best choice. 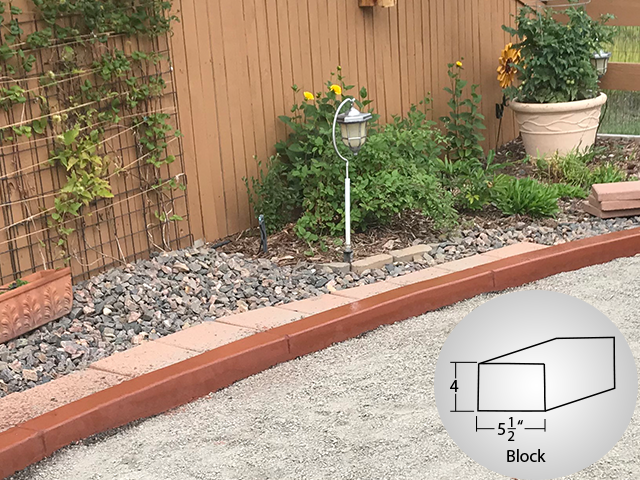 While we avoid comparing ourselves with other border companies, YARD CURB is the PREMIER CONCRETE BORDER installation company in DENVER, COLORADO. We are about our clients and continue with on-going service after the border is installed. We make certain our customers are satisfied with our product. It is our aim to develop a cotinued relationship with our clients. We ultimately gain friends, not just customers - this is one of the best parts of the business. Is Yard Curb a family run business? Yes! Yard Curb is a family run business having lived in Denver, Colorado for over twenty years. 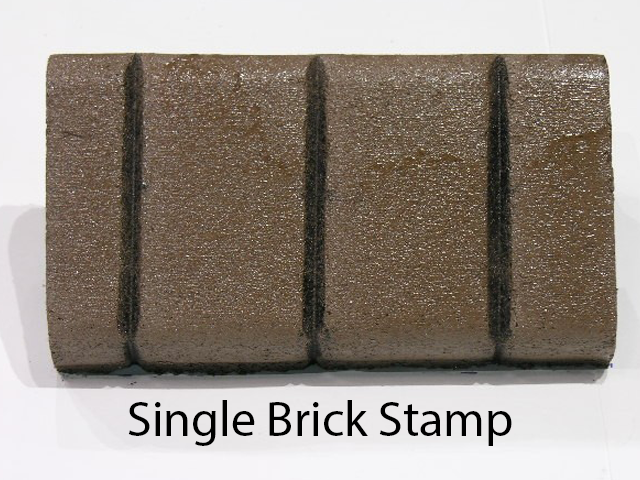 Yard Curb guarantees the product for one (1) full year against manufacturer's defects. If excessive cracking, flaking, chipping or separation of curb occurs during this time period, we will inspect the curb to determine the cause. Yard Curb's obligation to repair or replace the product shall not apply to any product which has been the subject of misuse or accident, altered or repaired in such a manner as to affect its appearance, or stability or used for any purpose other than that for which it was designed. Minimum footage charges will apply for any repairs due to damage, design changes, etc. Yard Curb is locally owned and operated in Denver, Colorado. We will accept phone calls from 7:30 am to 8:30 pm seven days a week. Estimates and the advise we give to you is completely free. Just give us a call, or e-mail us an we will give you our references. The Slant style became popular in the 90's because it can be stamped and textured or done in regular gray concrete as can the Curb style. 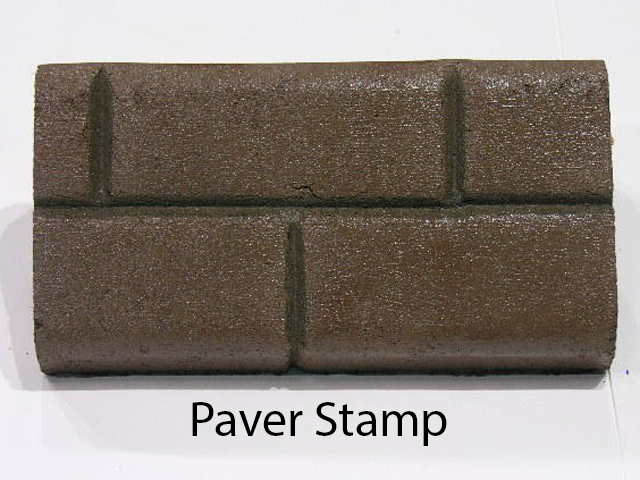 But, unlike the Curb style, it has the unique ability to also hold in gardening materials because the back of the curb is higher than the front. The front side of the curb is generally set at ground level to accommodate lawn mower wheels. 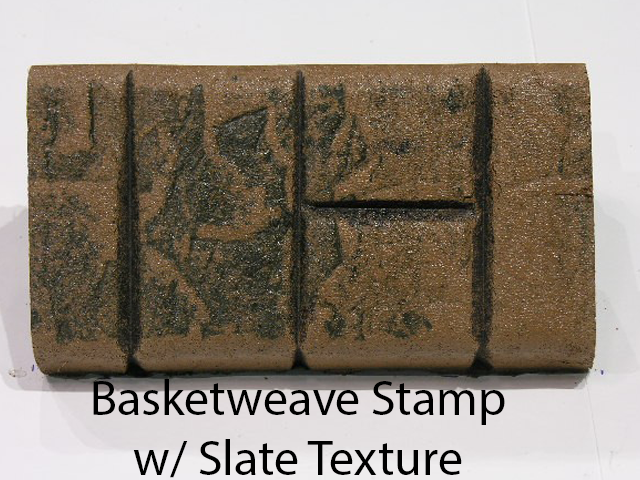 The slanted look shows off any texturing or stamping that may be applied. The Curb style is generally set at ground level for lawn mowing. It is very popular in commercial lawn settings because it handles larger mower wheels and has a more massive look. It can be installed as regular gray concrete or it can be stamped and textured. Because it is set at ground level it is not as easily seen from the street and therefore leaves a groomed look without seeing as much concrete edging.